The day I've been looking forward to has finally come.. my BFF's wedding! 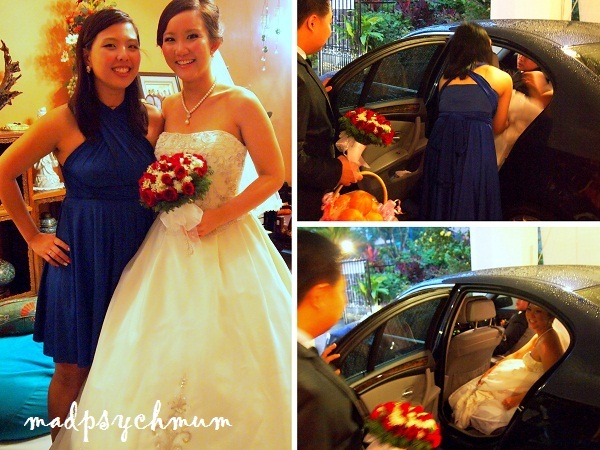 To make sure that we were not late for her big day (we had to arrive at her place at 4am! ), some of us stayed over at her house the day before. The next morning all of us actually managed to wake up, despite having only slept for 3.5 hours. The mother of the bride was a great host to us, preparing sumptuous breakfast to start us off for the busy day ahead. Breakfast is served! For those of you who are not familiar with Chinese matrimonial customs, it is customary that before the groom picks the bride from her home, he is to go through a series of "tests" set by the bridesmaids to test his determination and sincerity in marrying the bride. At each stage, he will also be pestered to give many ang pao (red packets) to show his sincerity. We felt that only having song and dance was probably letting the man off too easily so we concluded the 35min "games" with a final segment where he had to answer a few questions. If he got the answer wrong, they had to do a forfeit. If he got it right, they will receive 2 cubes, 1 of which might contain the key to her room. We didn't give them the correct cup of course so that meant they had to finish all the "drinks" *laughs*. We were supposed to torture them with more but couldn't as we didn't have time since the groom had to meet the bride at a very specific auspicious hour (7.05am!). After some phototaking with the gorgeous bride, it was time for the couple to head off for their traditional tea ceremony at the groom's place. 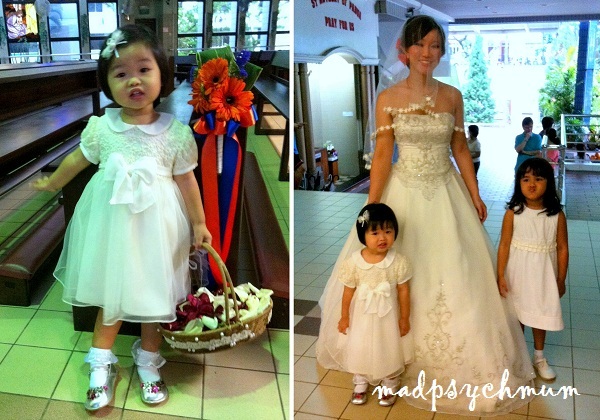 In the meantime, the rest of us were on our way to the church to decorate the hall and the reception area. 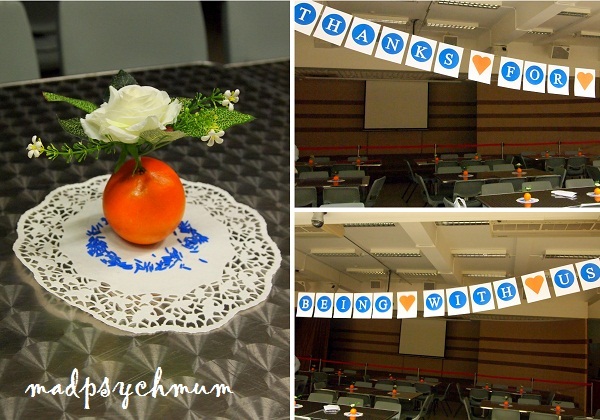 I was the decor i/c as usual and the colour theme was orange and electric blue. The bride also wanted organic elements which were both pocket and environmentally friendly. We finally settled on oranges and rice dyed blue for the decor of the reception area and welcome table. There were massive jams on the expressways as a result of the constant rain the whole morning hence the hubby arrived at the church later than expected. Nevertheless, baby girl was all excited to get started! As the other flower girl had also arrived, the 2 of them rehearsed their walk one last time before the big march down the aisle. My instructions to my girl were clear: walk and throw! After the couple and my girl had one last rehearsal in the restaurant, the bride bent down to speak to my girl at her level and she immediately followed suit. It was a really funny sight! And then it was time for the march in! This was only her 2nd time but she did it as if she has done it many times before (she's only 2.5 years old by the way)!